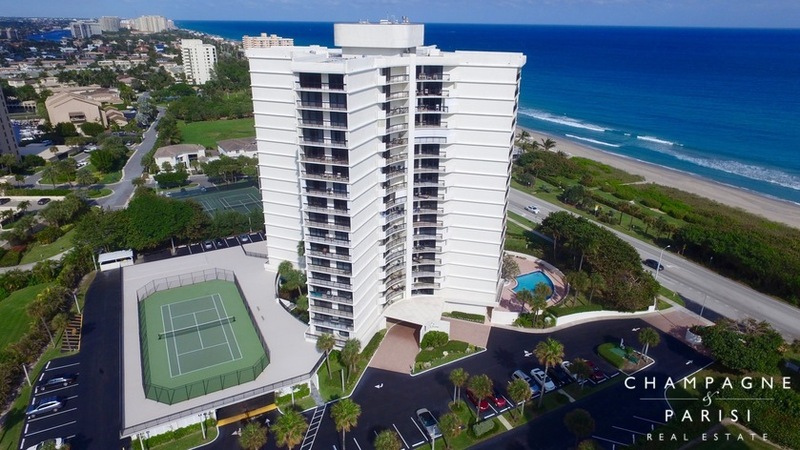 Admirals Walk is a 19-story boutique waterfront condominium community consisting of just 68 units located on the beautiful Boca Raton beachfront. This upscale community has received national recognition for its excellent standards of living. Each unit in this artfully designed condominium building is a corner unit located in its own wing, providing three different exposure views of the Atlantic Ocean and Intracoastal from the large wrap around balconies. Condos in Admirals Walk offer two- and three-bedroom floor plans and range in size from 1,900 to 2,250 square feet of living space. Originally built in 1974, many of the Admirals Walk condos for sale have been completely remodeled and now include many high-end features. Features include spacious open living spaces, large master suites with oversized closets, gourmet kitchens with stainless steel appliances, and in-unit washers and dryers. Admirals Walk recently underwent extensive renovations to the property which included concrete restoration of the entire building exterior and balconies, installation of hurricane impact glass throughout, replacement of the roof, installation of a full-building generator, new swimming pool and sundeck, refinished elevators, and new designer landscaping. The monthly condo association fees cover maintenance of the amenities, common areas, landscaping, and building exterior, building insurance, 24-hour security, as well as water, basic cable, and trash removal. Admirals Walk is located on the West side of Ocean Boulevard on the border of Boca Raton and Highland Beach. Residents enjoy the short walk across the street to the Atlantic Ocean and Boca's white sandy beaches. Several community parks are also located nearby including Gumbo Limbo Nature Center and Spanish River Park, which offers swimming, fishing, camping, picnic areas, and a dog-friendly beach on the weekends. Admirals Walk is also just a short distance from downtown Boca Raton and some of the area's finest dining, shopping, cultural, and entertainment venues. With its spectacular multi-exposure water views, resort-style amenities, and premier location, Admirals Walk offers residents South Florida condominium living at its finest. If you think Admirals Walk would be the perfect place to call home, you may also want to visit other condominium communities in Boca Raton such as La Fontana and Sea Ranch Club of Boca. If you would like to learn more about Admirals Walk or any of the surrounding condominium communities in Boca Raton, please contact us at 561-998-9015. You may also reach us by completing the simple online contact form below. We at Champagne & Parisi Real Estate look forward to assisting you in finding your next dream home in Boca Raton! Also, please consider registering for a free account which will enable you to receive automatic email notifications when new condos in Admirals Walk come on the market in Boca Raton, FL.